I'm just apologizing in advance for my upcoming blog posts. Most of the pictures were taken with my cell phone. Now that my youngest is movin' and groovin' my time is extremely limited! 1. Using dyes (please see picture below). You can use natural dyes... please see THIS post. You can use a couple drops of food coloring or liquid watercolors. Lastly, you can purchase bath tablets such as these seen HERE. 2. Placing different objects all of the same color in the bath. This is a great alternative for those of you who had concerns with the dyes. I set this up for my youngest (10 months). I don't have a picture of everything I put in (uh duh)... but it's pretty much just a bunch of random stuff we had around the playroom. I threw in some washcloths, silk tie, water balloons, etc. to give her different textures. There are maybe about 10 objects in this tub...and even that is a lot. I would recommend not putting to many things in the bath. It can be very overstimulating to your infant to have a bunch of different things going on at once... especially if bath time is typically a relaxing/calming time for him/her. 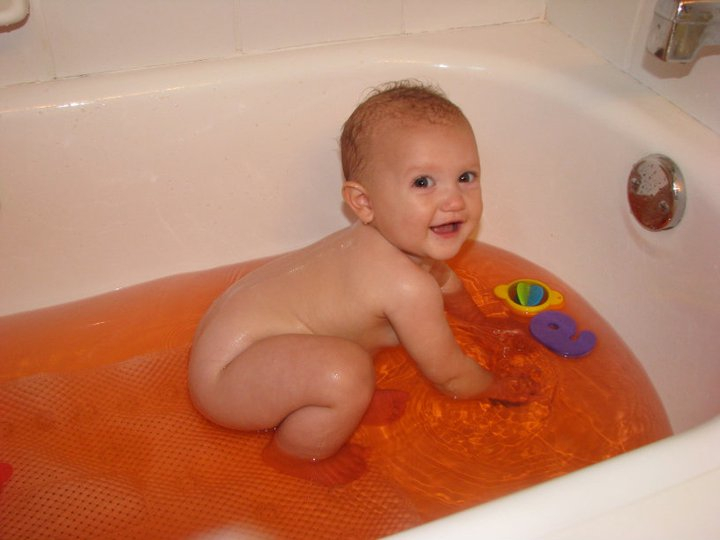 I would also suggest that if you do a colored bath with dyes to leave it at just that. 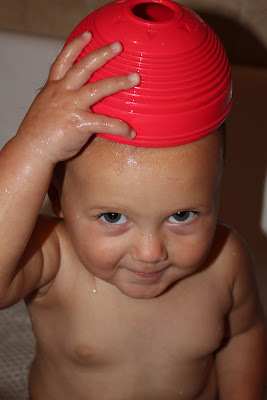 Talk with your infant on how you can pour/dump/splash/fill up etc. the colored water. When you use objects, as seen below, keep the water clear so it is more visibly appealing to them. "You're squeezing the red balloon. That must feel squishy and cold." "You have two red cups! Let's see if we can stack them." "We made a red tower!" "You have a red towel on you. That's so silly!! Where did ______ go?" There she is under the red towel"
"You have a red hat on your head. Whoa, that was a big splash. Look, your red hat is floating in the water now." What a super idea.Sometimes I dont know how I couldnt have thought it up myself. This is a must do, though. Thanks! My mom did food coloring baths with us when my sister and I were little. I have so many great memories, especially when she would let us choose which colors to mix. Sometimes, we ended up with icky brown, but it was still so fun!